In Part 1 of this recipe, as I hope you saw, we made a classic brine and soaked our pork for 48 hours to impart flavor and moisture. In part 2, we will slow roast the brined pork and then serve it very simply, as a classic Charcuterie plate. Since the traditional method for cooking our pork confit would be to cover it completely in duck or pork fat, we’ll have to adapt for the home chef. We’ll wrap our meat in plastic wrap and then foil, and roast it in a slow oven which will get us very close to the product produced by the traditional method. After 4 hours at 275 degrees, pork is left to cool completely. This can only be sliced cold, otherwise it would fall apart, so it should be refrigerated overnight. 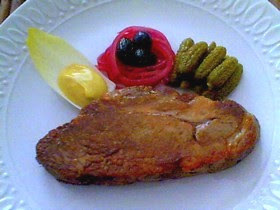 Then we give it a very classic plating with mustard, cornichons, olives and pickled red onions. Throw in a couple slices of toasted dark bread and you are in Charcuterie heaven. its right here and working fine. Sometimes YT's servers are down. Ok. I see. Now it works fine for me too. Impressed with how this turned out however a little confused on letting the duck sit to room temperature. That seemed to take a few hours to cool to room temperature before putting it in the oven. My instinct says the duck will get dried out that way. Is this so? How long should you let the duck sit before putting in the fridge overnight? You just dont want to put a hot package in the fridge. It wont dry out because its wrapped and covered in fat. I probably should be out an hour at least before going in. BTW, you said duck, but this is the pork recipe page? Do you mean pork? Sorry Chef John - I meant to put this comment under the Duck Confit Recipe. By the way served the Duck for appetizer for Christmas Dinner and my Family still can't get over the dish - unbelievable they said! I've tried this method with country style ribs, and even corned beef and loved the results. However, I went to Clorox's product page (they make Glad Wrap) and they do not recommend any use of polyethylene wrap in convetional ovens. of course not, used as is, without protection in a hot oven it would melt. But, in this recipe, wrapped in so much foil at low temp its fine. I had never had a confit. I had no idea what to expect. I made this this week for a valentines appetizer. Thank you for the easy to follow instructions and lessons. I'm afraid I do not understand. It seems to me you have made what I'm sure is a delicious slow roasted type of ham. Why do you call it confit? Does it taste like real confit? I just made some pork cofit and it was AMAZING. I just can't imagine that this would have the same flavor. Amazing recipe. Tried it and it was delicious. My piece of shoulder from the supermarket came with a huge portion of skin and fat which I cut away and I was left with a pretty shapeless piece of pork shoulder about 1 kg in weight which I eventually cut into 4 pieces and slow roasted your method for 3 hours. The remaining three pieces after the one I ate I'm storing unwrapped in the freezer, but it occurs to me that I can probably just store them in the fridge a few weeks in their original wrapping.